Given that she’s a teenager still living at home, Kamala Khan has had to deal with a lot of parental drama during her time as the superhero Ms. Marvel. A big part of that drama is her secret identity, and while she told her mother about her alter ego when they thought the world was ending, Kamala still hasn’t told her overprotective father. 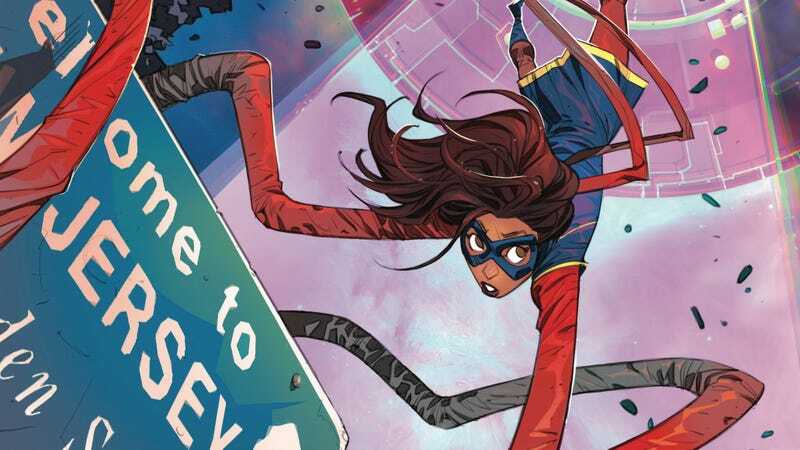 The first issue of The Magnificent Ms. Marvel #1 marks a significant shift in Kamala’s status quo when she finds out her mom has spilled her secret to her dad, but new writer Saladin Ahmed has even more twists up his sleeve. After disobeying her father and going out to fight aliens rampaging through Jersey City, Kamala comes home to see her parents dissolve into two puddles of goo, which is definitely a fake-out but one hell of a traumatic experience for a teenager to experience. Working with penciler Minkyu Jung, inker Juan Vlasco, colorist Ian Herring, and letterer Joe Caramagna, Ahmed has smoothly transitioned Kamala to a new series without her creator, G. Willow Wilson, and the book maintains the tone and visual style of its predecessor while sending Kamala in a different direction. That direction is up into space, and this creative team kicks off its run by establishing Kamala as a space heroine whose adventures become future legends for alien people. But before the change in scenery, the new team has to set the home stage to give any potential new readers an understanding of where Kamala comes from. This exclusive preview of next week’s The Magnificent Ms. Marvel #2 has Bruno showing up at Kamala’s house to find her in a state of horror as her parents melt in her hands, giving her a very personal stake in tracking down the aliens terrorizing her town. Minkyu Jung has worked for DC for the majority of his superhero career, acclimating to urban vigilante stories by drawing Batgirl and Nightwing. His linework, refined by Juan Vlasco’s inks, maintains the animated look of previous Ms. Marvel artists, and by keeping Ian Herring and Joe Caramagna on the creative team, Marvel maintains visual consistency across Kamala’s ongoing series.